The Philippine archipelago, with over 7,000 islands set in the sparkling Pacific Ocean, is an exciting and intriguing destination full of contrasts. The intense, dark brooding green of the tropical vegetation, the blinding white coral sands of the beaches, and the aquamarine blue of the surrounding tropical seas make for a fizzing cocktail of colour. Add the heat and humidity, suffused with the smells of cooking and tropical fruit hanging in the air; the colourful chaos of the towns and cities, and the brilliant smile that seems ready to erupt from any face at the slightest “provocation”, and you are getting closer to the distinct Filipino essence… From the island and beach life of the Visayas to Mindanao in the south, and from the wild frontiers of Mindoro and Palawan to the bustling metropolis of downtown Manila, Enchanting Philippines is a captivating portrait of this beautiful Southeast Asian island nation. Nigel Hicks was born in Bristol. He became a professional writer and photographer while living in Hong Kong, and subsequently travelled widely throughout Asia, working for a large number of book and magazine publishers. 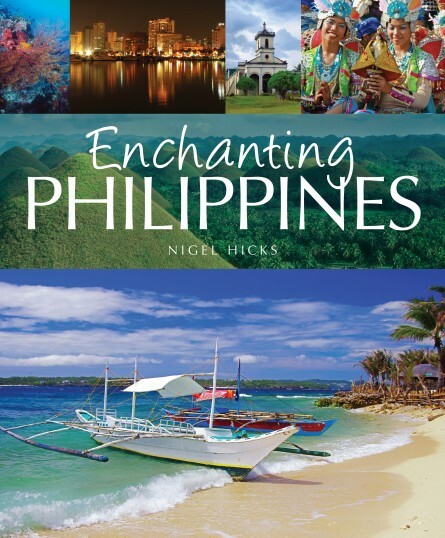 He has been visiting the Philippines regularly since the late 1990s, and has travelled the length and breadth of the country, photographing its cities, tourist destinations, protected areas, wildlife, and coral reefs. Nigel is an Associate of the British Institute of Professional Photography, Britain’s most prestigious professional photographic body. Size 260 x 215 mm / 10” x 8”. Extent 80 pages.